The New Play Control! line of games was originally designed as a twofold proposition: 1) To hark back some classics from the GameCube library and retrofit them with enhanced Wii controls as well as other bonuses, and 2) To fill the gap in-between software releases. Whether the NPC line succeeded in either of these goals is entirely debatable. Nonetheless, for twenty dollars apiece, it was nice to revisit these titles once more. 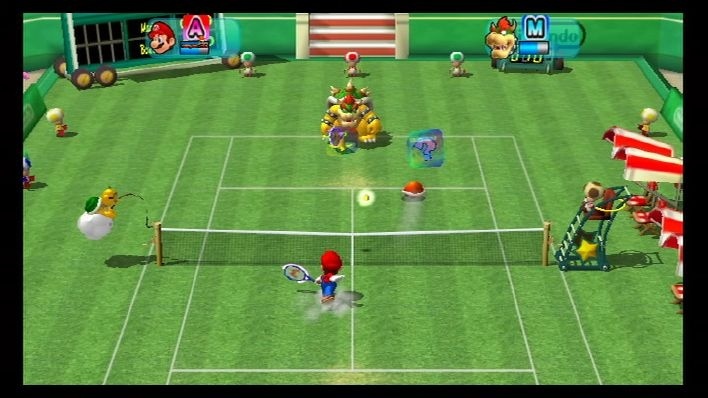 I really enjoyed the GameCube iteration of the Mario Tennis series, Mario Power Tennis. Its introduction of all-new gimmick courts, featuring obstacles and hazards like treadmills, Klaptraps, ghosts, and puddles of goop to give the sport of tennis some more Mushroom Kingdom flavor. The addition of power shots is something that arguably worked in the game's favor. It did slow down the pace of matches quite a bit, but they could be turned off if one wished. 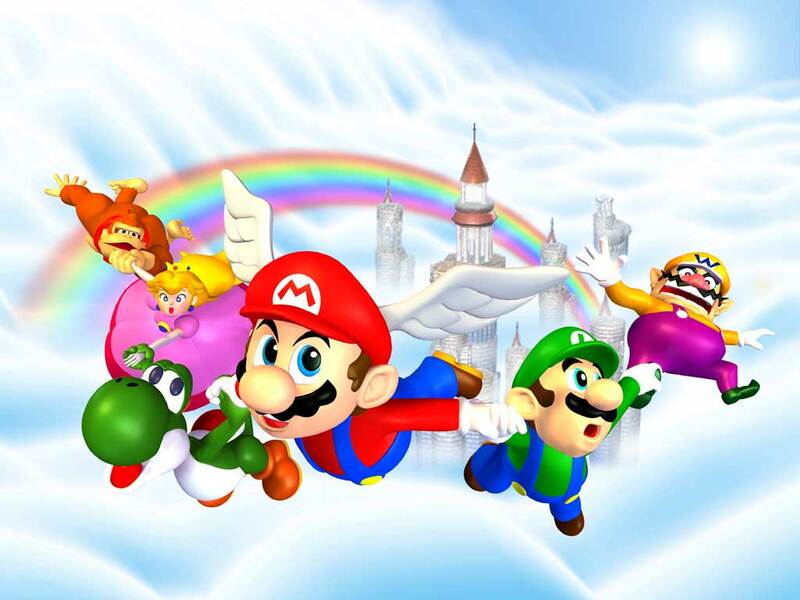 The cast of colorful characters consisted of the likes of standbys like Mario, Luigi, Peach, Daisy, Yoshi, and Bowser, and included atypical character choices such as Koopa Troopa, Paratroopa, Petey Piranha, Wiggler, and Fly Guy. The Wii version brings all of these aforementioned aspects to the fold, so it must be even better with Wii controls, right? Well, not exactly. The game hardly manages to read your ball-striking gestures, making you enter a den of relative frustration. By the time you're through trying to play a match, you'll have cursed as much as a classic John McEnroe match. You cannot be serious. Well, I am. Unlike New Play Control! Mario Power Tennis, the Wii version of the original Pikmin is not a bad game by any means. In fact, the brand-new controls work wonderfully with the game. The pointer is used to select targets and areas for your favorite fictional astronaut Captain Olimar to chuck his precious Pikmin army upon. His ship, the Dolphin, has crashed on a foreign planet (though it is remarkably similar to a certain planet you and I live on), and meeting the helpful Pikmin, the capable Captain Olimar search across five unique levels to find his missing ship parts. 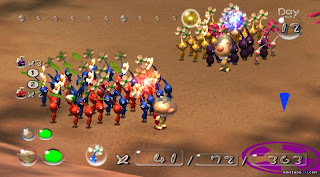 The reason Pikmin is listed as number five is the annoying (at least to me) time constraints. You have a limited number of days to succeed in Olimar's mission, and the constant pressure can get to a more timid player! Regardless of this, Pikmin is a modern classic that demands your attention, Wii or GameCube. 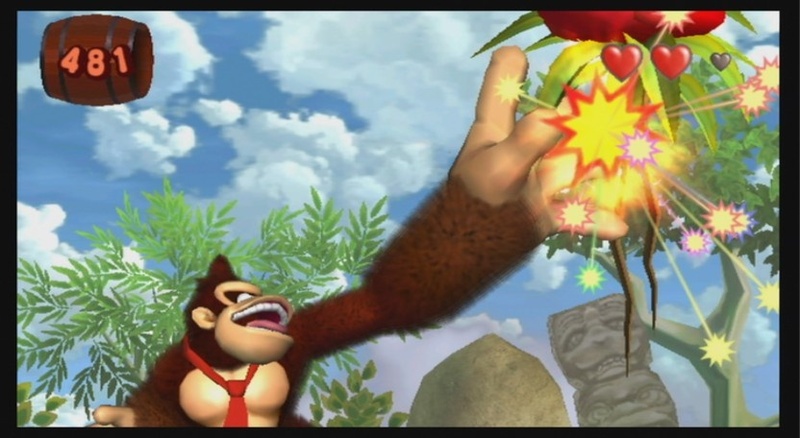 I adored the GameCube exclusive Donkey Kong Jungle Beat. This game came out around the era of Nintendo experimenting with their main monkey after they parted ways with Rare, the developer behind the Donkey Kong Country trilogy on the SNES/GBA, the Donkey Kong Land games on Game Boy, and the 3D platformer Donkey Kong 64 on the Nintendo 64. Nintendo made the criminally overlooked DK King of Swing for the GBA, but they also developed this ace of a title. The game had players bashing a bongo drum controller. Tapping the right drum would move DK right while tapping the left drum would-- you guessed it-- move him left. The faster you tapped, the faster the banana-craving monkey moved. After extended periods of play, one's hands would hurt considerably. Meet New Play Control! Donkey Kong Jungle Beat. Instead of tapping, you have a control stick on the Wii's nunchuk to move DK around. 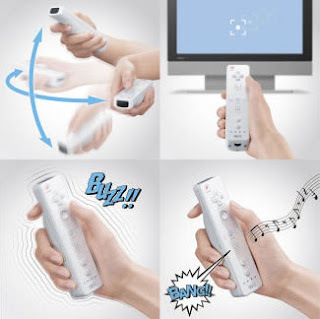 Jumping is assigned to the A button while smacking foes and nabbing 'nanas is the job of shaking both the Wii remote and nunchuk. At first glimpse, the game seems relatively short, deceptively so. Gunning for high banana totals earns you crests which unlock secret, more difficult kingdoms filled with new levels. It's a fantastic game, and one that the team would move on from to make a little-known classic called Super Mario Galaxy. While the sequel still had time to worry about, you didn't have to be anxious regarding beating the game within so many number of game-time days. Olimar's employer, an intergalactic shipping company, has gone in mad debt, and Olimar's boss sends him and newcomer Louie to the planet that the Dolphin previously crashed on in order to salvage as much valuable treasure as possible. Getting out of debt is never easy, after all. 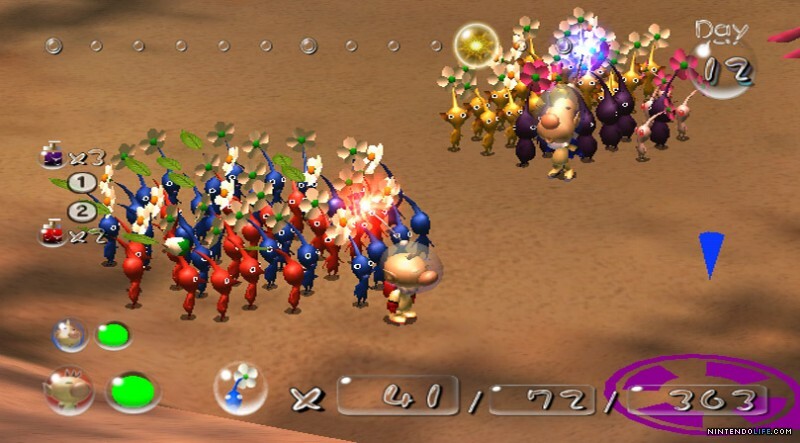 The Pikmin quickly get reacquainted with Olimar, and vow to assist him on his adventure. There's even two new types to be found, Purple and White Pikmin. 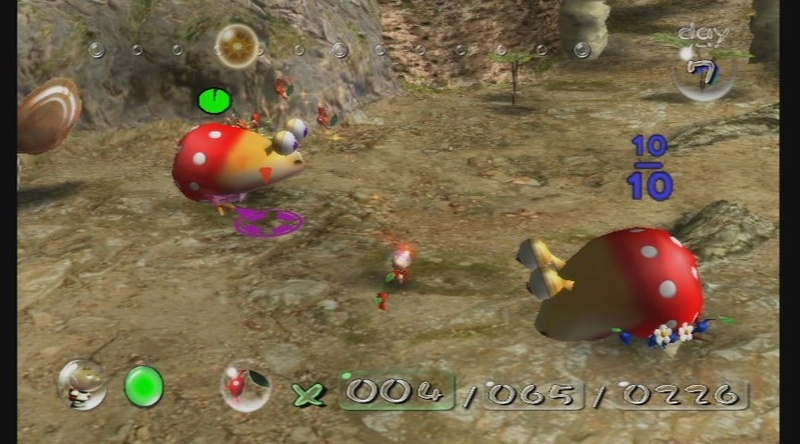 Purple Pikmin are heavy creatures who may be slow, but they can really whoop a baddie brutally. 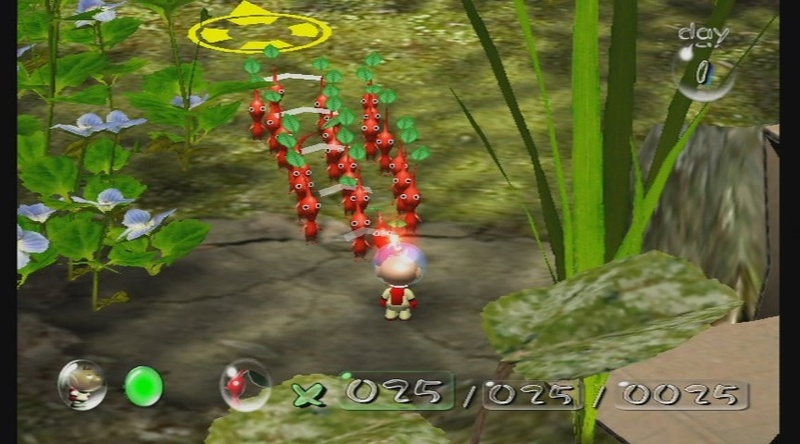 Meanwhile, White Pikmin are poisonous (great for wading through toxic areas) and can uncover buried treasure. 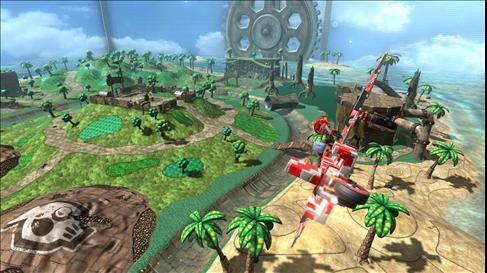 Despite their being only four levels in this sequel, the levels present are large and well designed. They also feature various caves which are essentially levels of their own. Deeper and deeper you delve in search of loot and survival. The greatest horrors lie in these dark and dank sublevel of the caves. Pikmin 2 is very much an improvement on the original's formula, and the Wii iteration brings with it the same superb pointer controls of New Play Control! Pikmin. There were a lot of changes going on as well as a ton of hype for the sequel to the highly successful-- both critical and commercial-- Metroid Prime. Retro Studios had a lot of work to do if they wanted to appease their fans, and they quite possibly crafted yet another masterpiece. 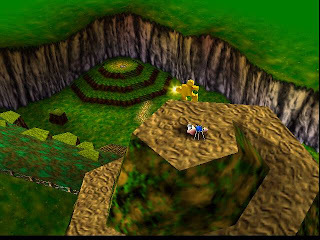 The light and dark world mechanic, similar to what was found in The Legend of Zelda: A Link to the Past, allowed players to transport themselves between both worlds, solving environmental puzzles, earning new suit upgrades such as for the first time in 3D history, the Screw Attack, and overcoming obstacles. Yes, the near end fetch quest might have soured some opinions of the game, but when you have such tight controls (especially the Wii's version highly responsive point to aim controls) the fun outweighs the bad most definitely. 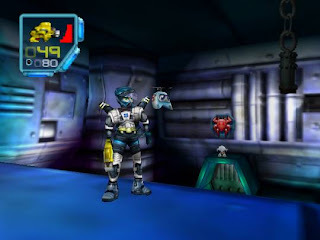 Added to this game and perhaps a precursor to the Nintendo DS's Metroid Prime Hunters was a multiplayer mode for up to four combatants, all playing as different colored Samus Aran characters. The lack of bots made this mode nothing more than a novelty for me and others. 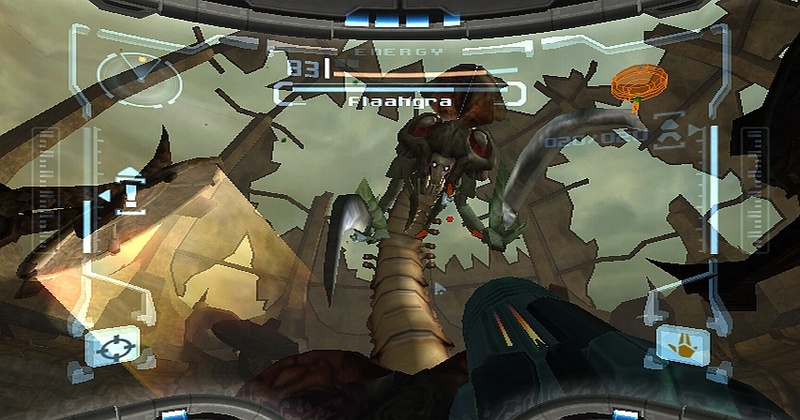 That said, Metroid Prime 2: Echoes is another essential play for any self-described gamer. 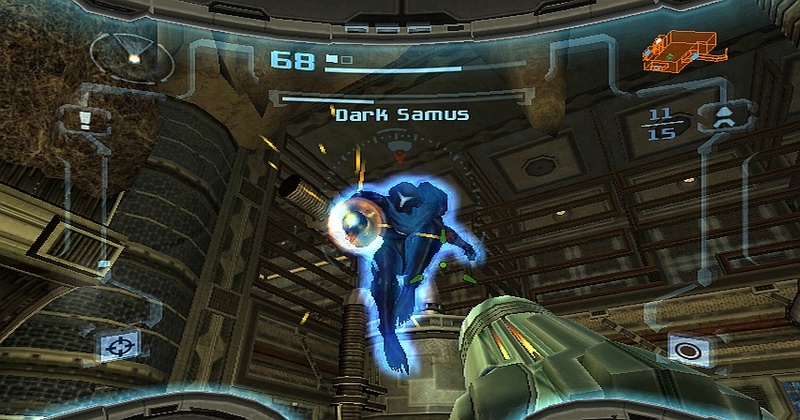 Note: The Wii version can only be found outside of Japan in the Metroid Prime Trilogy collection. 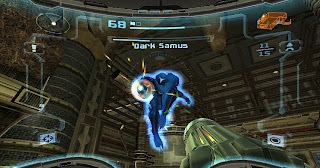 After multiple gos at transitioning Metroid from a 2D side-scroller to a fully 3D game, Shigeru Miyamoto stepped in and suggested that the wet behind the ears team at Retro Studios turn the game from a third-person action game into a first-person adventure. A crazy idea, but it would turn into be an extremely successful and novel one. From the moment you step foot on the planet of Tallon IV and have the steamy surroundings fog up your visor, you know you are in the midst of something sensational. 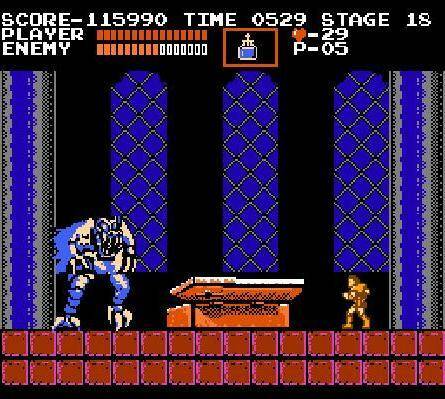 The map design was impeccable, the abilities' tremendous representation in 3D, and the creature and boss design were all fantastic. The story was subtle, usually requiring the player to scan data from objects, wildlife, plant life, and computers strewn about the planet to gather information. The secrets like extra energy tanks, power bomb upgrades, and missile tanks were hidden especially well. Every inch, every segment, and every room of the world of Tallon IV had reason for existing. Metroid Prime is one of my favorite titles of time, and the Wii edition makes this the superior iteration. The controls are smooth, flawless, and make precision a priority and almost effortless to do. The fun of flanking foes and blasting them from behind is always a treat, and taking down the expertly created bosses is always a thrilling prospect. If you can somehow manage to score a used copy of Metroid Prime Trilogy, then you will no doubt play one of the best games in Nintendo's grand history. Note: The Wii version can only be found outside of Japan in the Metroid Prime Trilogy collection. Rank Up! is all ranked out. We have flourishingly conquered yet another edition of this popular and most requested segment. Next week we will be hitting court and ranking the Mario Tennis games while our tennis rackets are still hot. Until later, have a magnificent weekend! Now, here's something completely different. I've never had a guest review that was a retro review at the same time. Can't say that anymore, I guess. My older brother enters Dracula's castle with wooden stake in hand to give us this review of Castlevania. With the upcoming Fall release of Castlevania: Lords of Shadow - Mirror of Fate for the 3DS, seems like a good time for this review. He wrote the actual review, I wrote the "witty" captions. Enjoy. Back in the mid-80s, many companies were trying to get the hang of creating their own platforming franchises to compete or at least offer an alternative to Nintendo's Mario series. One such company was Konami as they cracked the whip to deliver a franchise that has been going strong for over a quarter century now in Castlevania. While the series has had many classics along the way such as Symphony of the Night and Dawn of Sorrow, I wanted to go back to the roots of this franchise to see if they still held up after all these years. Castlevania sees Simon Belmont running through six levels of three stages each to try and stop Dracula and his minions from terrorizing and transforming the populace into a deadly dystopia. You start off as a man with just a lame whip to attack, but that's okay. You can not only upgrade the whip twice as you go along, but Simon will also find sub-weapons like a cross, holy water, or an axe that he can use by press up along with the B button. You can only use the sub-weapons if you have enough hearts (the game's "magic" currency) to do so, and these can also be upgraded to be used up to three times onscreen at once by collecting tablets with the numbers II and III on them. If you collect a new sub-weapon, you have to recollect the tablets, so it's best to just stick with whatever weapon you find most valuable. has six levels. An inside joke, if you will. While I'm glad there are plenty of ways to stick it to Dracula's undead armada, that certainly doesn't make the game an easy one. In fact, a good portion of the difficulty in this game comes from the fact that when you die, you lose all of your upgrades and current sub-weapon. This really got to me in a short stage in the middle of the game when you have to face two bone dragons right before a boss that hops around all over the place. Even though the whip got fully upgraded again, I had no reliable sub-weapon for taking down the boss or the dragons right before that fight and paid the price over and over again, watching as all of my extra lives dwindled down to zero. It was only when I managed to survive the entire level with my fully-upgraded self that I was able to beat that short but painful part. Ah, stairs... the bane of my existence. 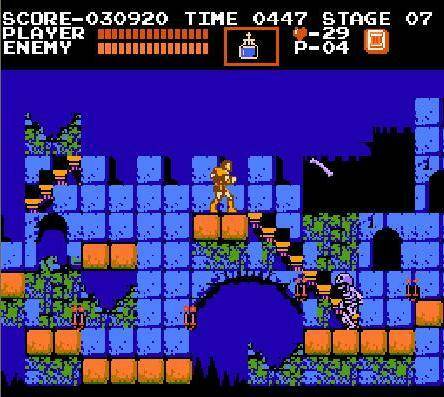 Enemies are also generally a nuisance when there are multiple ones on the screen at once. Any foe that flies will be a constant danger of knocking you down into a pit, but they'll usually be teamed up with harder enemies that need to be taken down before they deplete your health bar. Flea Men are the worst as they'll hop up, down, and all around to mess with your character that doesn't exactly have the grace of a Mario or Mega Man. In fact, once you've committed to a jump, you're stuck going in that direction until you land. That can and did mess me up on a couple of occasions, but it's nothing that breaks the game. 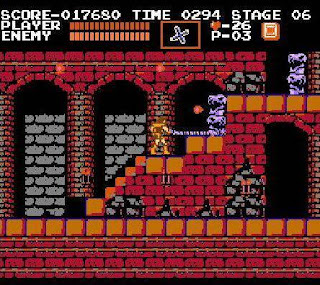 It's just an old school NES platformer that expects you to memorize the levels and adjust to them. Whoa. Nice makeup work, man! 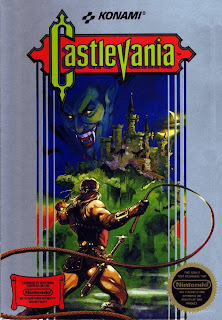 Overall, I enjoyed my short time with the game, but I do feel that as with many platforming franchises that began on the NES, there would be sequels in the Castlevania series that would come along to refine the gameplay into a more enjoyable experience. Still, it's a pretty good starting point if you just want to have a title that you can pick up, play, and probably finish after an afternoon's worth of frustrating fun. I was hoping this game was coming in a Localizations, Please! segment. Now, it finally is. October for Europe and November for North America. While this teaser trailer shows no gameplay footage at all, it does shed some light on some of the story elements regarding Layton and Luke's fifth adventure together. At the end of the evening yesterday was a special Nintendo Direct. Well, they're all special in their own way, so that's a bit redundant. Did you know about it? ...Oh? Well, since you're such an in-the-know gamer, you probably don't even need me to tell you that in this version of the game you are the mayor and can make your town, your way, and can customize your house inside and out, and you have even more varieties of furniture to work with, do you? Then don't bother watching this gameplay footage taken directly from the Japanese live feed. See if I care! Welcome to the final part of Killer Soundtracks - My Personal Favorites for a little while. We have been through forty of my favorite soundtracks with me cherry-picking the best pieces from each game and broaching a bit about them. Today is no different as I have ten more terrific soundtracks to share from various different platforms including the Xbox 360, the Wii, and the Dreamcast. How about we get to steppin'? 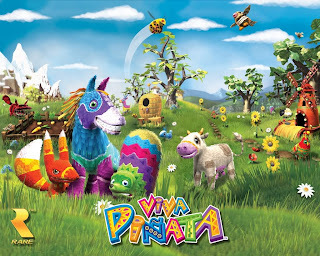 I mentioned this game's sequel in my top ten list of Rare-developed games, but the original Viva Pinata was the archetype for that game. 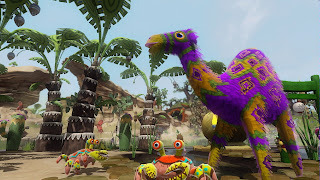 Trouble in Paradise merely built upon the preexisting foundation that Viva Pinata created to make a better game. Viva Pinata is the kind of game that harks back to when Rare was in top form. The colorful charm and wild whimsy that their past successes with Nintendo were known for shined brightly with this title. The music was beautifully orchestrated with soothing strings, majestic-at-day, tranquil-at-night themes, and quaint melodies. You can clearly hear what I'm talking about with pieces like Day 1, Day 2, Day 3, Day 4, Day 5, Night 2, and Night 3. There's a childlike sense of wonder to each song, don't you think? 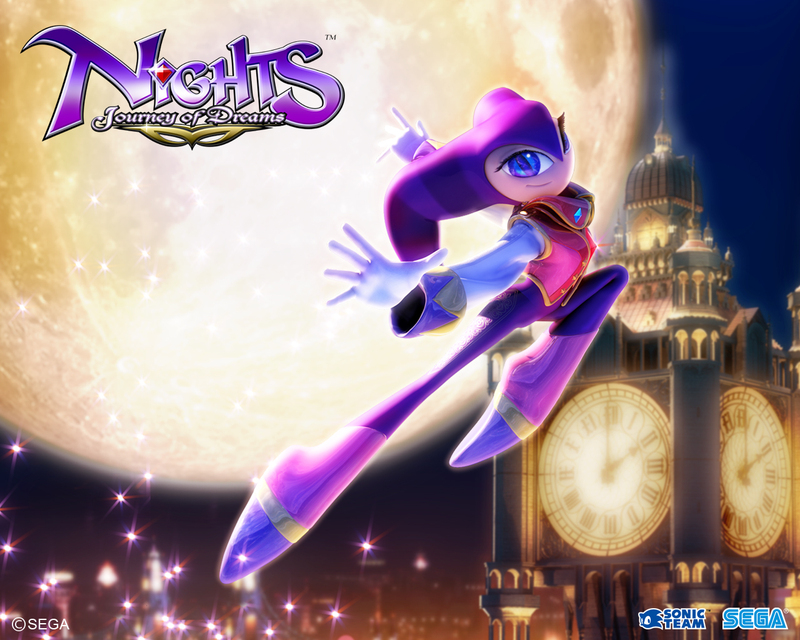 A game that came out of nowhere, NiGHTS: Journey of Dreams featured a return to the familiar gameplay of the Sega Saturn classic with some adjustments in the form of new gameplay and the bad decision of allowing the two child protagonists, Will and Helen, to explore hub worlds. The new additions weren't necessary as fans just wanted pure NiGHTS gameplay. Leave it to Sonic Team to push more gameplay styles than they are fit to handle. 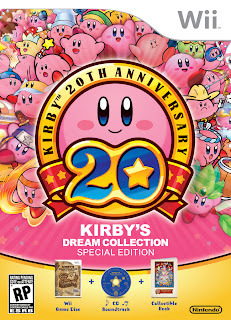 If anything, Journey of Dreams gave players an outstanding soundtrack to listen to with songs like Eloquent Echo, Drifing Donbalon, Wandering Wildness, Electrical Entertainment, Merry Memory Go Round, Queen Bella's Ball, and the theme song for the series, Dreams, Dreams. 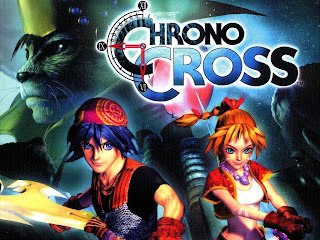 Yasunori Mitsuda (Xenogears, Chrono Trigger) has yet another tremendous-sounding score with his work on Chrono Cross, one of the better PlayStation One era RPGs-- and there were a lot of them! Yes, some might argue that there were far too many extraneous party members to track down and take care of, but the world itself was enjoyable enough to explore, the story was gripping enough to be entertained by, and the music was and still is truly terrific. When you have tracks like the opening theme of Time's Scar, a brilliant boss theme in Dragon God, the sad The Girl Who Stole the Stars, both versions of the first town in the game, Arni Village with Home and Another, the shanty of Another Termina, and Forest of Illusion, how could you not get fully encompassed by Chrono Cross? 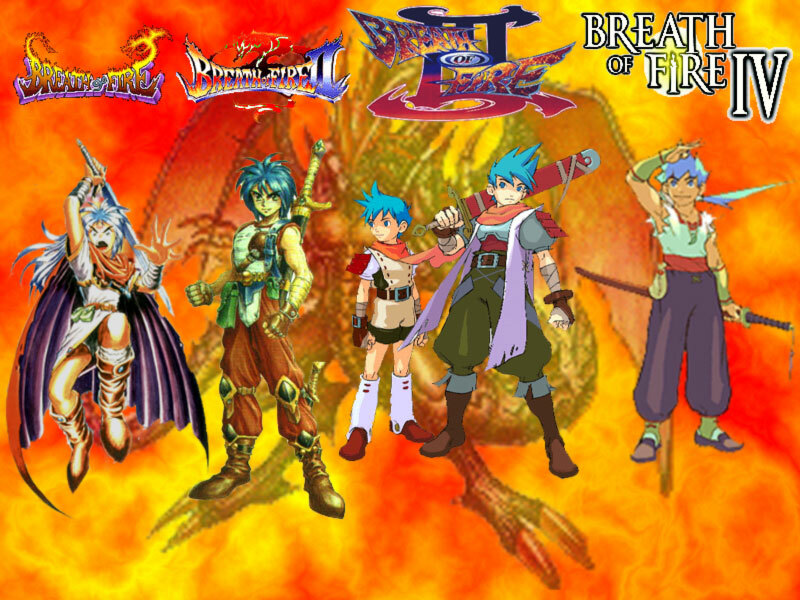 Breath of Fire is truly a role-playing classic. It brought about a simple story of redemption, war, and dragons, an adventure-filled world, and plenty of enemies to slay. The music (done in part by Yoko Shimomura of Kingdom Hearts fame) is equally as wonderful. The Super Nintendo sound output always came off as better to me than the Sega Genesis's as most Genesis titles came off as rough and metallic. Blood Relations, Fate, Day and Night, Gentle Breeze, A Road, Battling, and Music City show off the brilliant musical minds of the composers included. With a new generation to be had and a transition into an all-new adventure in full 3D, Sonic Adventure led the charge and was one of the two most prominent Dreamcast launch titles, alongside SoulCalibur. Some didn't like the focus on rock of the soundtrack, but the bright and bouncy music was perfect for speeding through sparkling shores, racing down snowy mountains, and breaking all kinds of traffic laws in Speed Highway. 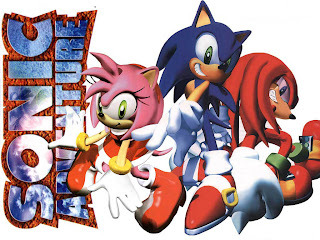 Perhaps the best songs from Sonic Adventure include Welcome to Station Square, Azure Blue World, Windy Hill, Be Cool, Be Wild, and Be Groovy, Run Through the Speed Highway, Red Hot Skull, and Skydeck A Go Go!. I was seriously impressed when I initially heard the sound quality coming out of the Nintendo DS systems small speakers. It wasn't the most astounding sound on the planet, but it was quite good. 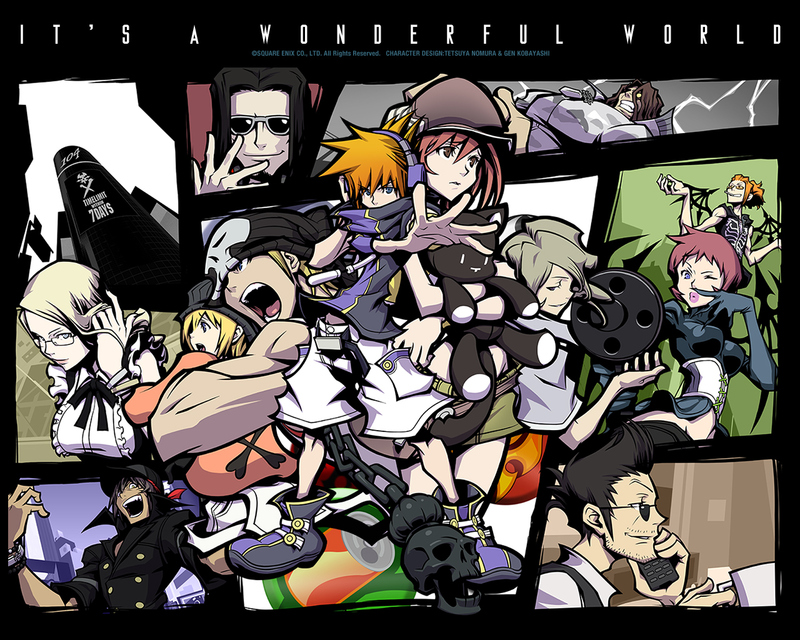 The World Ends With You showed many skeptics of Square Enix that they could still experiment and wind up with something good other than always heavily banking on Final Fantasy and Dragon Quest. 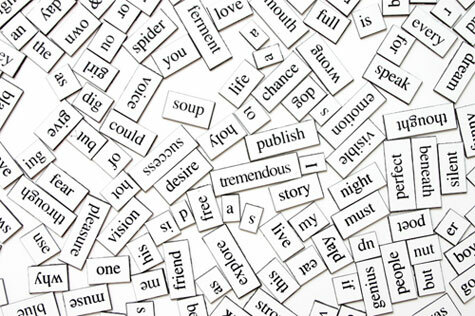 The most popular songs are generally vocal pieces like Calling, Hybrid, Someday, Emptiness and, Give Me All Your Love, Game Over, and Twister. It is an eclectic mix of music, for sure. 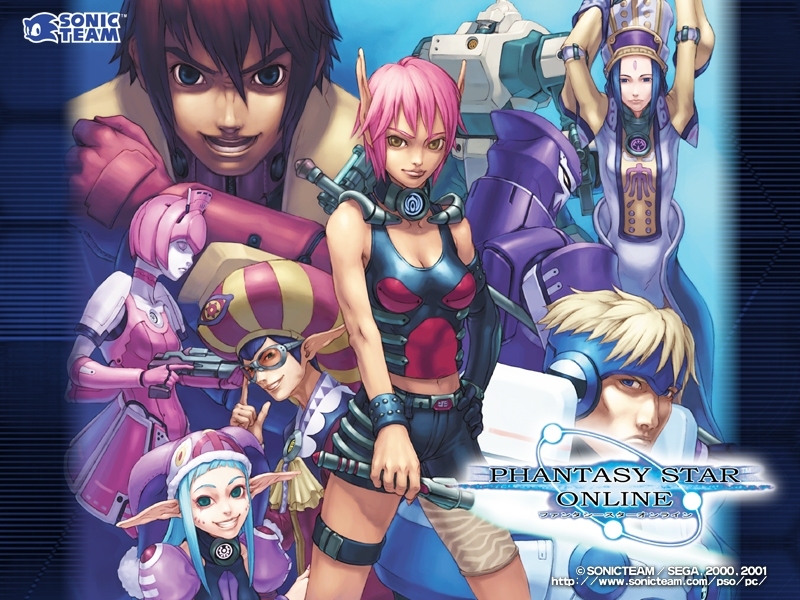 Why just settle with Phantasy Star Online when you can use the whole soundtrack from the GameCube and Xbox release of Phantasy Star Online Episode I and II? Well, that is exactly what I'm doing here. We have such fabulous themes from the original Episode I like The Whole New World, Can Still See the Light, You Have Nowhere to Go, and After the Story 2; and themes from Episode II such as A Longing to Ancient Time Part 1, Tricktrack Part 1, and The Frenzy Wilds. One thing that will seemingly always stay of high quality with Sonic Team is their stellar soundtracks. 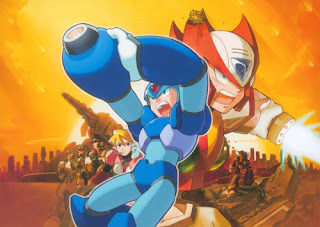 Mega Man X5 started the downward slope in quality of the X series. Now, X5 wasn't a poor game (even though changing up the names of the Mavericks was a stupid decision); it just paled in comparison to its predecessor. However, the music across the series has retained its superb standards of quality. This is immediately apparent through songs like Grizzly Slash Stage, Squid Adler Stage, Izzy Glow Stage, Axel the Red Stage, Duff McWhalen Stage (a callback to Bubble Crab's Mega Man X2 stage) X vs. Zero, and Sigma 2nd. Not the best Mega Man X soundtrack, but a competent one all on its own. Did you really think we could go through an edition of Killer Soundtracks without a mention of Mario? How about a second coming of Mr. Yasunori Mitsuda? The man behind more dignified-- if you will-- works lent his ability to the first Mario Party game, which still holds its place as the franchise's best musical outing yet. 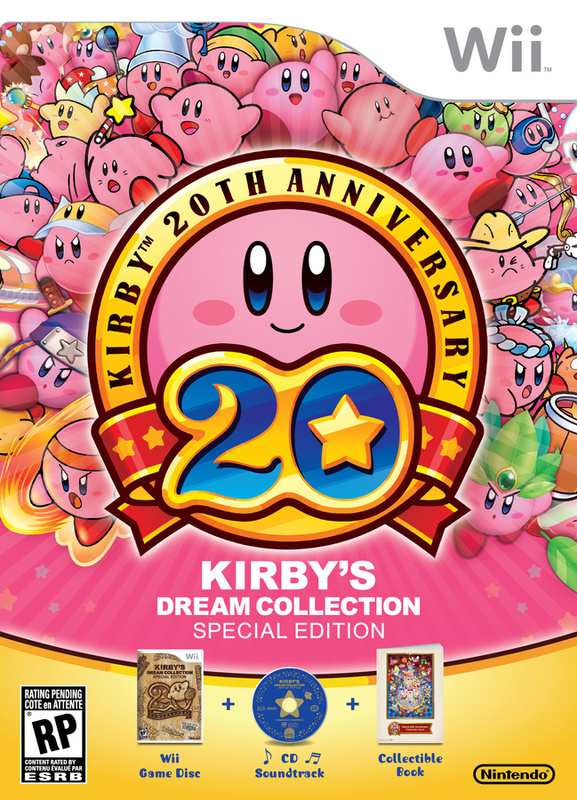 Themes like Rainbow Castle, Tropical Island, Engine Room, Play a Mini-Game!, Hit or Miss Chance Time, Ending, and Eternal Star fill me with such happy nostalgia. I was very glad to find that some YouTube users had uploaded music from this grossly overlooked game in the Nintendo Wii's library. It's The Sky Crawlers: Innocent Aces, based off an anime. One reason that the title remains in my memory is the sensational score. 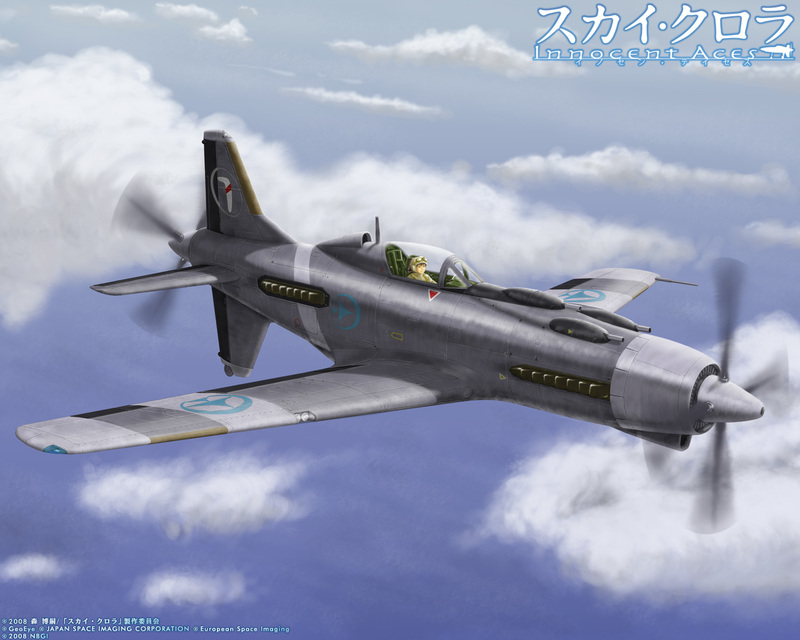 Intense air battles were common for the game, and the accompanying music made the action all the more profound to play. The pickings are slim as to what is represented of the music on YouTube, so here are the available examples for your listening pleasure: First Sky Duel, Rally, Critical Briefing, VS Kaida, and VS Orishina Final Final Battle. Did you somehow miss a previous part of Killer Soundtracks? Shame on you! Well, no worries as I have all four previous installments listed below for your convenience. Hop to it! Rare was one of my favorite developers around. The keyword there is "was." A couple of years ago they are completely restructured by Microsoft and turned into one of their many Kinect studios. For people who have fond memories of Rare's games, this made them very upset. But Kinect Sports and its sequel are capable Wii Sports clones, and rumor is that Rare is making a serious title for the next Xbox. While we wait to read and/or hear news of their project (Rare is known for their copious amounts of secrecy), I have a list of my top ten games developed by Rare. The company was at their heyday on the Nintendo 64, but those games aren't the only ones on this list. Let's kick it off with number ten. Following up the original Perfect Dark with something capable is no easy task. In fact, it's almost impossible. While Perfect Dark Zero should not be said in the same sentence as its N64 predecessor, this imperfect game is still a fun-filled first-person shooter. 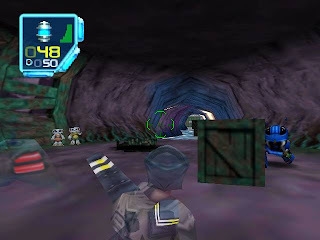 It followed the N64 game's mission structure of having multiple objectives in a given mission to complete. Instead of just three difficulty settings, an all-new Dark Agent mode was added, offering the highest amount of blistering challenge. Turning Joanna Dark into a bratty American girl was a questionable decision, and the story was campy at best, but the actual missions were an enjoyable experience. The creme de le creme for me, however, was the robust multiplayer modes, featuring vehicles like tanks and jetpacks. The huge sprawling maps were filled with places to hide as well as camp, and taking on bots (a must for any console shooter) was a blast. 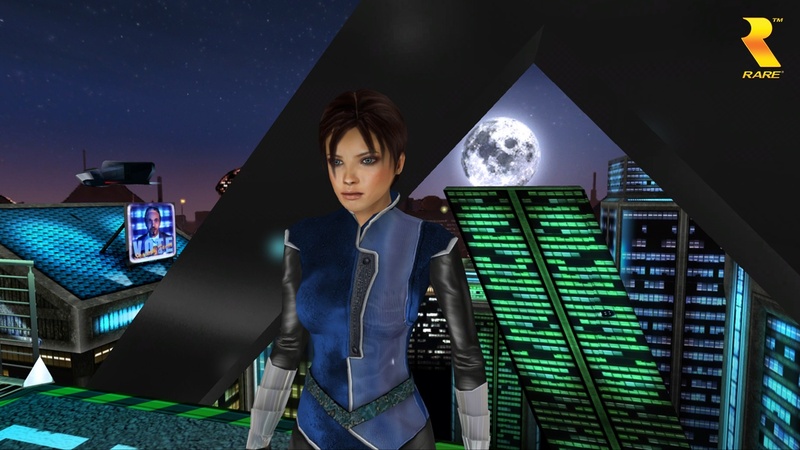 Perfect Dark Zero might just be my favorite multiplayer Xbox 360 game. 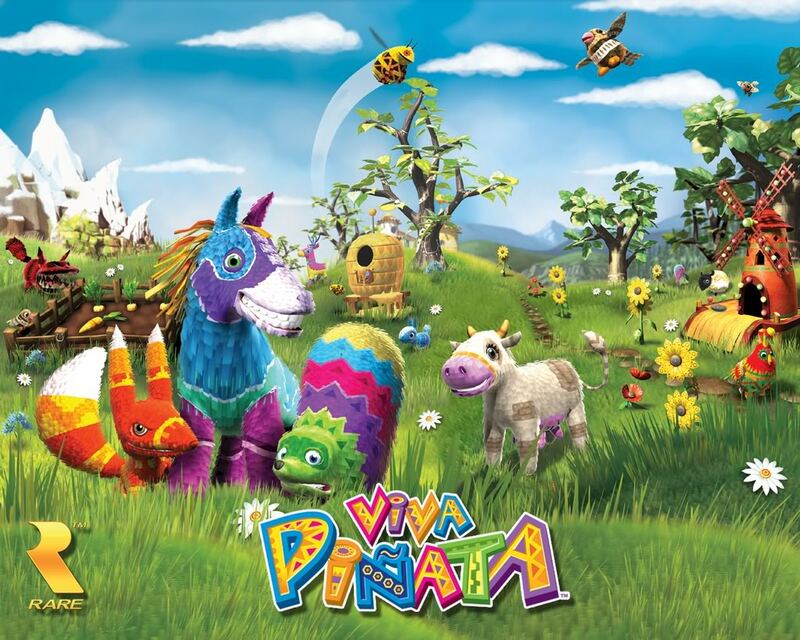 The sequel to the underrated Viva Pinata, Viva Pinata: Trouble in Paradise was a sequel that I didn't see coming. The original did not set sales charts on fire, even with a kids animated cartoon show as marketing. 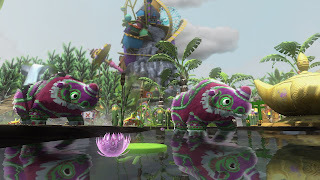 Regardless, the goal of the game was the same: create a garden and use different methods to lure various pinata varieties to your happy healthy home and coax them into becoming residents. Of course, there were numerous stipulations that needed to be addressed in order to get them to move in. Some pinata types simply don't get along, so having to create the perfect balance of pinata groups was paramount. New to this installment of the series-- alongside the several new species of pinata-- are two unique vistas-- a polar landscape and a desert landscape. I greatly like the Viva Pinata series because it sort of channels the old Rare when they had unadulterated charm and enchantment in their titles. 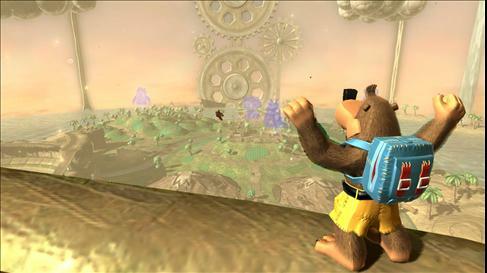 Originally teased as the third fully 3D platforming adventure in the series, Banjo fans had the excitement drained out of them when the final project was shown. 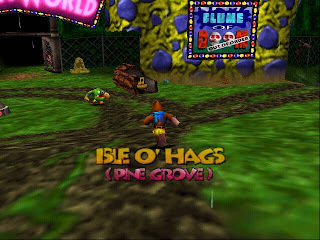 Banjo-Kazooie: Nuts & Bolts had all of the humor and personality of previous entries in the franchise. The only change-- and it was a big one-- was that instead of mostly earning Jiggies (the Super Mario 64 power stars equivalent of the Banjo-Kazooie games) through platforming challenges, Banjo needed to complete missions by the Lord of Games (or LOG). Through picking up vehicle parts strewn about Showdown Town, the game's hub world, and purchasing them in Mumbo's Garage, players could build impressive and original vehicles to the limits of their imagination. Each mission had its own objective, but the way to accomplish them was up to the player. Why push soccer balls one by one into a goal when you can place multiple balls into a vehicle sporting a huge cart and drive it into the net? That saves both time and frustration! Perhaps if the game didn't have the Banjo license plastered on it fans would have been more open to the game. As it stands, the title was yet another flop for Microsoft's Rare in sales. Some call the controls clunky, but I found them fully functioning. Jet Force Gemini was the action science fiction adventure starring the Jet Force Gemini trio of Juno, Vela, and their precocious pooch Lupus in a quest to defend the galaxy from an alien bug threat led by the sinister Mizar. At the start of the game you choose between the three characters, each starting on different corners of the galaxy, and playing through three unique planets before reaching Mizar's Palace. Once all three have reached the palace, the battle with Mizar begins. What follows is something detractors of the game say bored and annoyed them to points of unbridled venting-- the need to go back to previous levels and enter once unreachable areas as other characters and gather all of the tribal creatures. While this can appear as unnecessary padding to some, I didn't mind this and welcomed being able to go onto past planets and explore them with the other characters. The presentation is top notch, sporting what I had listed prior as one of the Nintendo 64's best soundtracks period. And who doesn't love splattering the walls with the blood of your enemies? Does that make me disturbed? 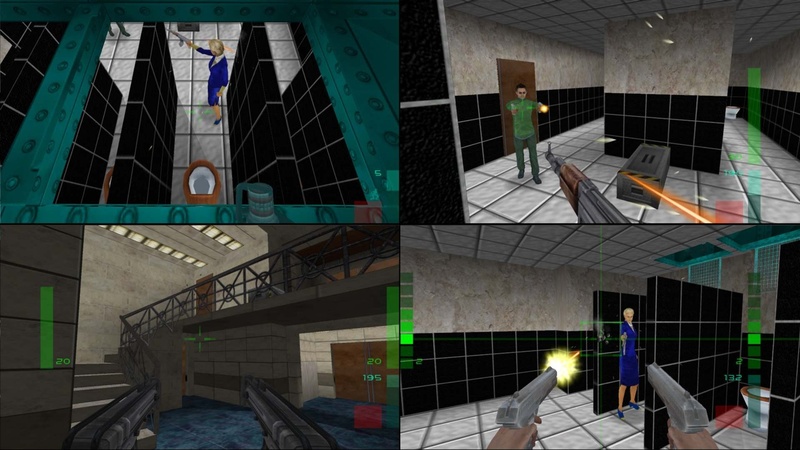 Despite its impact on console FPS games, GoldenEye 007 still only makes number six on this list. Why? Well, number two on this list, a better FPS, is why. That doesn't mitigate the importance of GoldenEye at all. 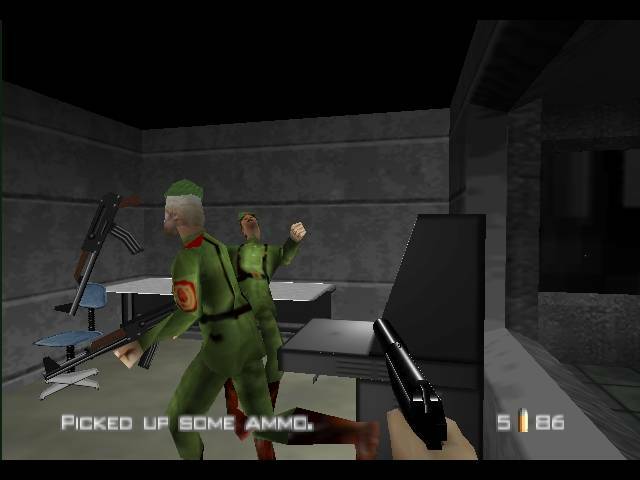 Coming out a year or so after the actual movie came out and being made for a system that the developers didn't even know the final specs of, GoldenEye made objective-based missions, limb and extremity damage, gun zooming, stealth elements, and multiplayer death matches on consoles popular for the first-person shooter genre. Many games prior to GoldenEye mimicked games like Doom and Quake, but suddenly the genre was turned onto its head. Who knew that a game that was originally devised as an on-rails shooter like Virtua Cop and had a poor showing at the E3 prior to its release would be such a revolutionary game? 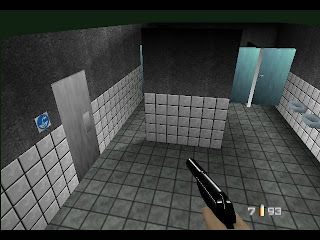 My main gripe with GoldenEye 007 is the lack of bots, which at the time was almost impossible to achieve with the constraints the development team had. That said, it's a reason why number two is number two and GoldenEye 007 is number six. Banjo-Tooie took everything that was special about the original Banjo-Kazooie and made it even bigger. Did that mean it was necessarily better? Well, that depends on who you speak to. One on hand, the worlds were interconnected this time around with multiple connections to other worlds without even having to reenter the hub. On the other hand, the game was so colossal in scope that it was sometimes incredibly overwhelming, especially when you had to bring characters from one world to another via Chunky the train. Banjo-Tooie brought back a revenge-seeking skeleton of a witch, Gruntilda, and her two sisters sporting their first and only appearance in the series. The witch destroyed Banjo's home, killing Bottles in the process. 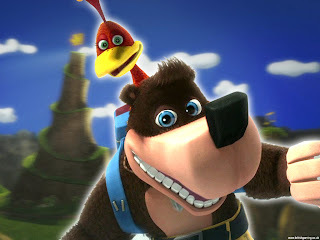 Thus, the journey to seek vengeance for Bottles was made by Banjo, Kazooie, and newly playable character Mumbo Jumbo (his Banjo-Kazooie role in Banjo-Tooie was taken by Humba Wumba). In Banjo-Tooie, Banjo and Kazooie could be separated from one another, and oftentimes this was necessary to nab otherwise inaccessible areas, Jiggies, and musical notes. 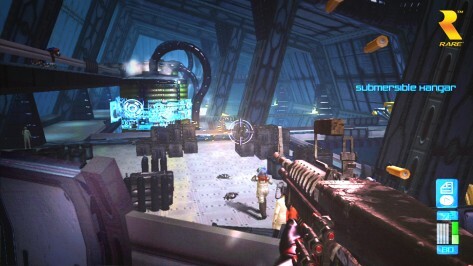 The game also added a multiplayer part with various mini-games and a FPS-like mode. 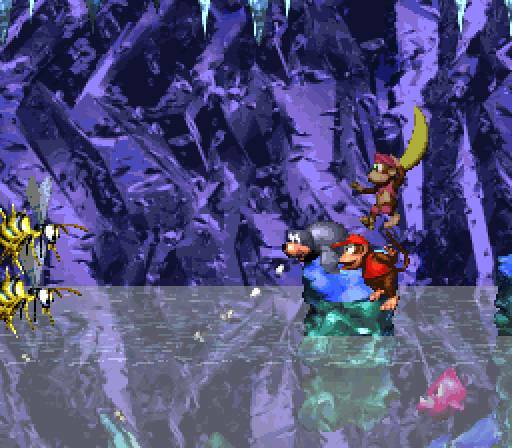 Overall, Banjo-Tooie was filled to the brim with things to do, maybe too much so. 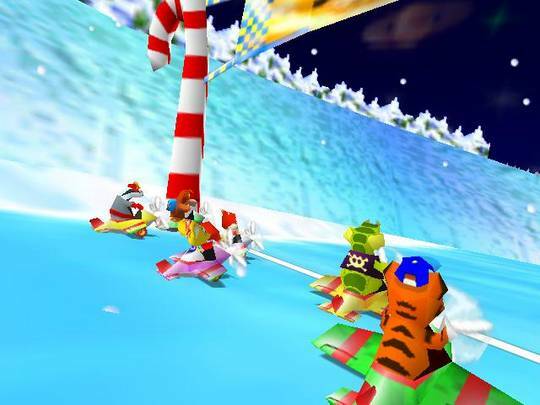 The ultimate kart racing experience, Diddy Kong Racing effortlessly outdid Mario Kart 64 in multiplayer fun, mayhem, and options. 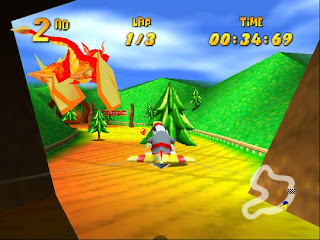 While Mario Kart had four cups with four difficulties, a battle mode, and time trials, Diddy Kong Racing showed off a brand-new concept, an adventure mode, in addition to its grand prix, battle modes, and time trials. The adventure mode was fresh as it took players across the 20+ tracks in different locales like windmill-laden plains, dinosaur-rich valleys, sun-soaked beaches, snowy wonderlands, and a futuristic planet with goal of scoring first place in all of them. 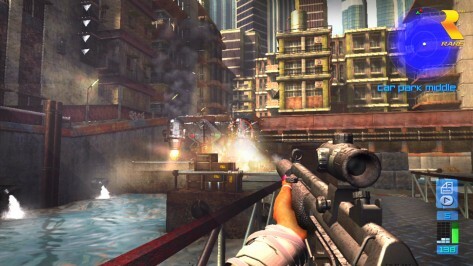 Boss races were added as well as challenges where players needed to gun for first as they collected eight precariously placed silver coins. All of this led to two showdowns with the oinker of a sorcerer, Wizpig. This story-like formula would be the inspiration for another excellent kart racer, Crash Team Racing on the PlayStation. The changes to the standard kart racing genre didn't end with an adventure mode either as Rare brought in two unique types of vehicles into the mix: hovercrafts and airplanes. 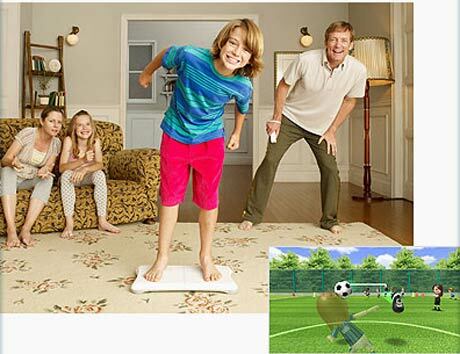 The items were much more balanced than Mario Kart, too. Finally, Diddy Kong Racing introduced the world to two new characters: a then little pleasant-tempered squirrel named Conker and a bird-less Banjo. A port of DKR would make it to the DS, but the forced touch screen controls simply ruined the game for many including myself. Stick with the superior original, gang. The oldest game on this list from Rare (I never did get into their NES and earlier creations), Donkey Kong Country 2: Diddy's Kong-Quest is one of the best platformers on the Super Nintendo, just getting beat by both Super Mario World games and Mega Man X. 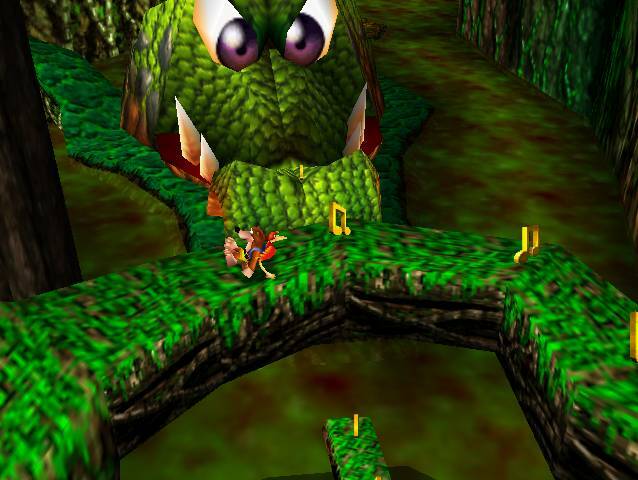 The game had players controlling Diddy Kong from the previous Donkey Kong Country and newcomer Dixie Kong, who was great for beginner players as she could whirl her hair around like a helicopter to slowly descend across gaps. 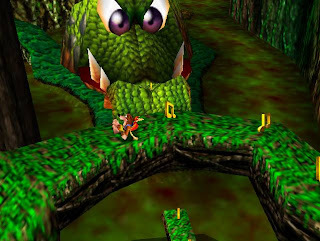 Like Donkey Kong Country before it, Diddy's Kong-Quest kept acquainting players with new gimmicks-- and I mean gimmicks in the good way. Not the "I don't like change so I call everything that tries something new a gimmick" gimmick. I'm talking about constant new challenges and obstacles for Diddy and Dixie to overcome on their adventure to save the captured Donkey Kong from the villainous Kaptain K. Rool. One level you'll be racing on a roller coaster, trying to reach first place in time, while another you'll be inside a submerged pirate ship, hitting a sea otter to constantly cool down the "otter"-wise scalding water. Each level consistently offers something novel to the gameplay and level design. The secrets are many and well hidden, and the presentation is some of the Super Nintendo's best. It is simply remarkable how rich the worlds come off as with the stellar backgrounds and ambient music and sound effects, water swishing and iron striking iron, for example. 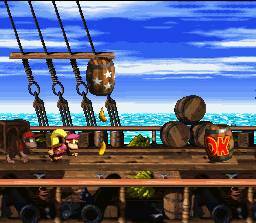 DKC2 is without a doubt a classic that no fan of 2D platformers should go without playing. I said number two on this list beat out GoldenEye 007 for several reasons. Well, now that you're here, why don't I shed some light on what I mean by that? 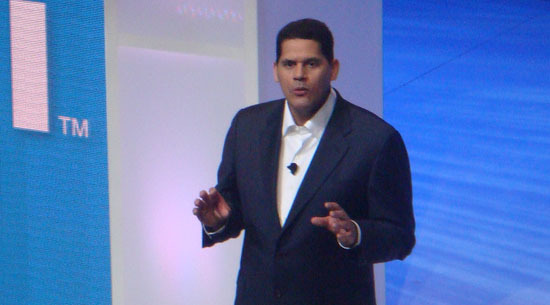 Originally a game that would take light and darkness into account within the gameplay, that idea was shelved and development continued, despite the project leader leaving Rare. Many delays were had with Perfect Dark, but the end result was something that was nearly... well, perfect. Like GoldenEye 007, the mission structure was open-ended, allowing players to freely take on the various objectives (with more objectives to do being added on higher difficulties) in the order they saw fit. The story involved a conspiracy between a powerful corporation and an ancient alien race with Joanna Dark and the Carrington Institute, her employer, being smack dab in the middle of the action. It was all the foundation for the excellently designed levels and fast paced, intense action. 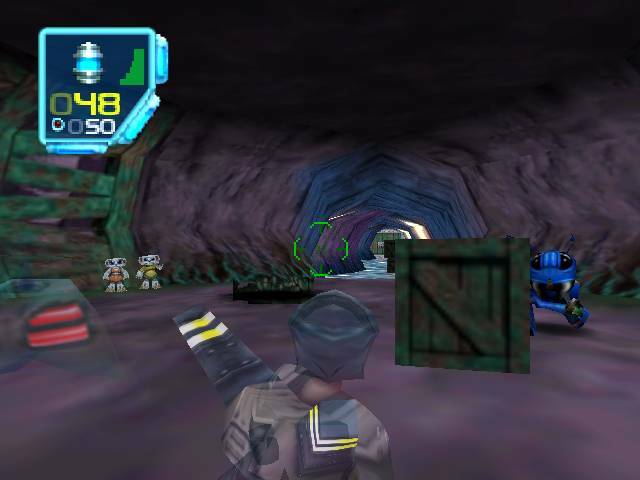 By far the most desirable part of Perfect Dark is the immense amount of multiplayer functionality to be found in the game's Combat Simulator. The multiplayer maps were huge, filled with large areas to explore, places to hide, places to get a jump on your opponents, and areas to be wowed by. Bots were finally here, and they were available to be customized with various personalities. Some could attack you with only their fists, some would only go after the person who killed them last, and some loved explosives a little too much. The AI was also sensationally smart, too. You could easily design your own match types with enough modifications that no two types might ever be the same. Perfect Dark is my personal favorite first-person shooter of all time. Ms. Dark, you've certainly hit the mark. 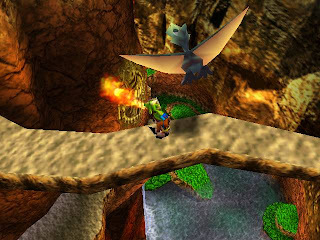 This game was highly anticipated from Rare by owners of the Nintendo 64 and fans of platformers alike. Super Mario 64 laid the framework for how platformers should work in three dimensions, and Banjo-Kazooie took that framework, ran with it, and created an even better game. Starring a friendly but sometimes bickering bear and bird, Banjo and Kazooie start off on an adventure to reclaim Banjo's bear-napped sister who the nefarious witch Gruntilda wishes to steal her good looks from. I'm thankful old Grunty nabbed Banjo's sister or else I wouldn't have an excuse to enjoy the finely crafted, colorful, and wide open worlds of the game! The bear-bird duo learned a myriad of moves like the steep slope-climbing Talon Trot, the ability to shoot eggs from the front or (ew) the rear, and the power to fly. A supporting cast member by the name of Mumbo Jumbo could turn the pair into a multitude of animal and object creations (for a price, of course). From termites to flighty bees, Mumbo's magic allowed Banjo and Kazooie to access conditionally inaccessible areas. The Xbox Live Arcade version of the game is what I consider to be the definitive version. The N64 game had a caveat that if you perished and hadn't collected all 100 musical notes, it would only record your highest note total prior to your death and put back all of the notes in the level. In the 360 version, if you die, you do not have to recollect notes, and you can just start collecting the notes you missed (instead of having to collect ALL of them). Banjo-Kazooie is the epitome of genius Rare philosophy in level variety, design, and quality; colorful presentation and tremendous music; and terrific humor and charm. What are your personal favorite games developed by Rare? Do you lament the company not being as sharp as they once were? What are your most cherished memories playing games by Rare, or do they not have as much as an impact on you as they did me? 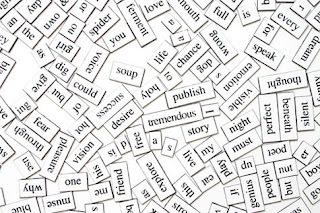 Feel free to let your thoughts flow in the comments section.